this is what Dad calls our "loot from the capitalismfest". Dan calls it "crap we don't need", which is easier for people like me who are 7.15 years old to understand. Dad calls his phrase a "Churchillian euphemism", and everybody is supposed to know that it means the same thing as Dan. 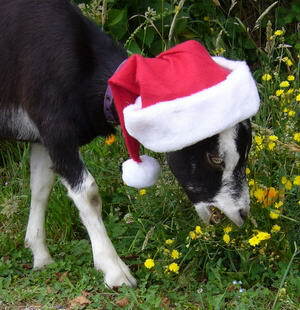 Goat Claus even gets in on the act... this is Lance having his Christmas flowers and wearing the hat Kent sent. Like Lance needs a hat!